Reading progress update: I've read 0 out of 528 pages. My bookclub meeting place just received several Llewellyn ARCs this week, and thus I walked out with this one today! It's also available on NetGallery. Llewellyn's tried hard to shake off the "worst pagan publisher" label for the last couple years, so it'll be interesting to see what a semi-established author like this--particularly one who got her start in the terribad '90s witchcraft craze--comes up with. I'm optimistic. 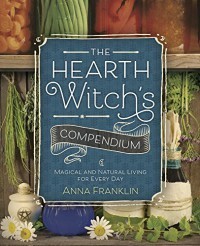 The little I know about Anna Franklin is that her research tends to be shallow 101 material, but her recipes are fantastic. The COMPENDIUM is almost entirely recipe-based. It looks good from my casual skimming thus far. The contents are focused on practical applications of the Craft (and also winemaking) instead of the ever-popular abstract rituals and meditation exercises. The design work is very pretty, too.